Here on this penultimate day of August, despite being teased with a brief glimpse of fall weather last week, it is still most definitely summer. I read today that this weather will continue for another two weeks. To beat the sweltering heat of a Korean summer, I'm sure many of you have turned to 냉면 to cool off. I like 냉면, I really do (see our review of our favorite 냉면 place), but unlike Annie, I don't think I could eat it every day. I suspect that because I didn't grow up eating it, I find the noodles to be simply too chewy at times. However, you might recall from our Saboten review that I do like cold soba (buckwheat noodles). Kind of a lot, actually. Now that, I could eat every day! 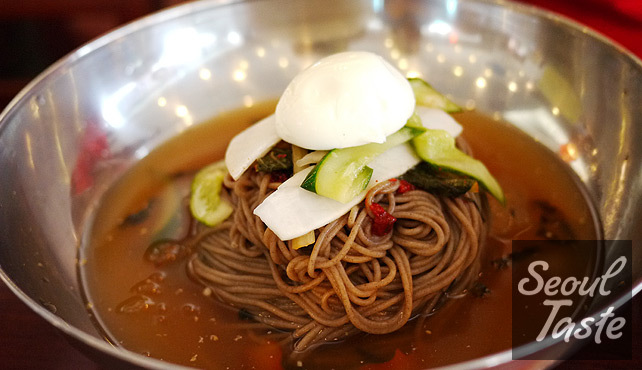 Recently, we heard of a restaurant that serves what is essentially cold soba in the style of 냉면. That sounded to me like the perfect summer lunch. 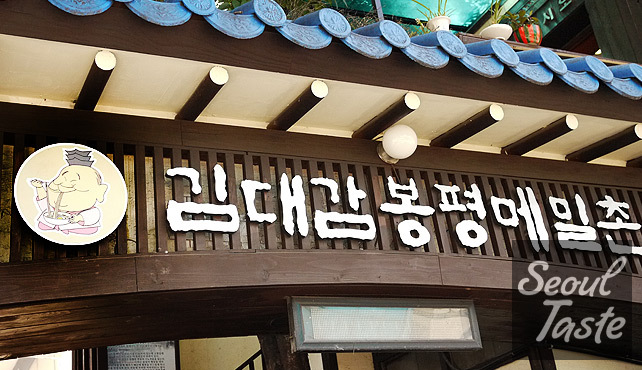 The name is quite a mouthful: 김대감봉평메밀촌. I presume Kim Dae Gam is a person and Bong-pyeong sounds like a place. Memil means buckwheat, and the -chon suffix means village, so... Kim Dae Gam's Buckwheat Village in Bong-pyeong, perhaps? For lunch, they provide just one or two 반찬, but there was one notable one, which I didn't remember seeing on our first visit, some kind of potato rice cake. We thought it was 송편, since 추석 is coming up, but after doing some reading online, we're not sure about that. 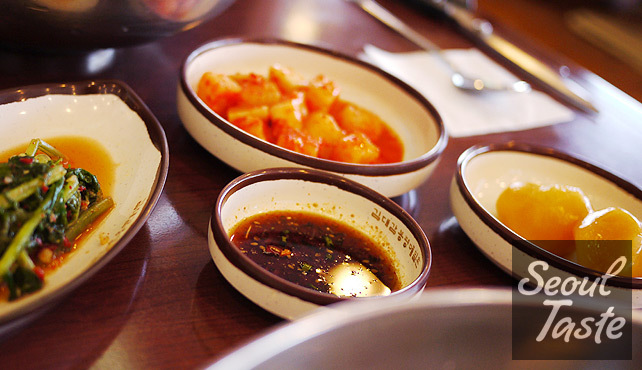 As an appetizer, we recommend the 메밀만두. It's just mandu made with buckwheat, but it's not a gimmick. 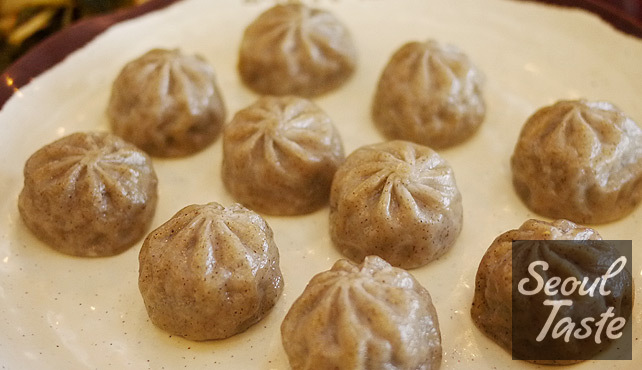 They're some of the tastier mandu we've tried! The outer skin has a nice consistency and a good buckwheat flavor, and the filling of noodles, chives and meat is delicious and well-balanced. 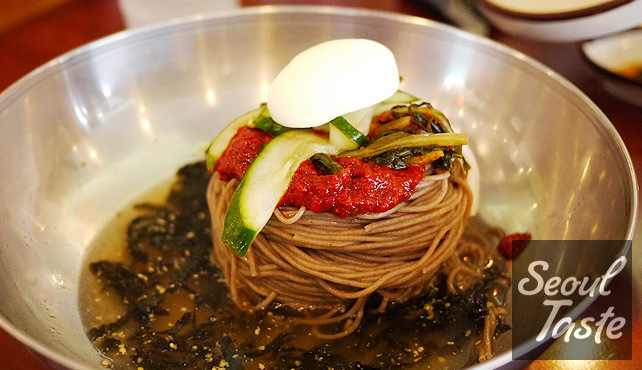 At a 냉면 restaurant, Annie eats the 물냉면, and likewise, here, she ordered the soupier version of this dish, which they call 물막국수. Likewise, I normally order 비빔냉면 so I ordered that version, 비빔막국수. It actually has a little bit of soup in it as well, unlike most 비빔냉면. It's hard to tell from the picture, but these bowls are enormous, and the roll of noodles is gigantic. It's bigger than your typical Korean portion size, I'm actually glad they don't come anywhere close to filling the bowls. (Still, we have seen people ask for a double order of noodles. Whoa!) The soup has some sesame seeds and seaweed bits that impart a nice roasty, salty flavor. This is one of the best cold lunch options I've found, so if you happen to be near Kyobo Tower, it's well worth checking out (especially if you're a fan of buckwheat noodles). Note that because it is right next to Kyobo Tower, it fills with office workers rather quickly starting from before noon, so try to get there by 11:45 or so. There are also a few other locations (I noted Yeoksam, Bangbae, Garak, Sinjeong, Hanam) if you search for the name on Naver 지도, etc. Food: 4/5 - Good stuff! I am hesitant to give out 5s before I really feel like I know a place (we have only visited twice so far), I will probably upgrade this rating later. Service: 4/5 - Ditto for this rating.